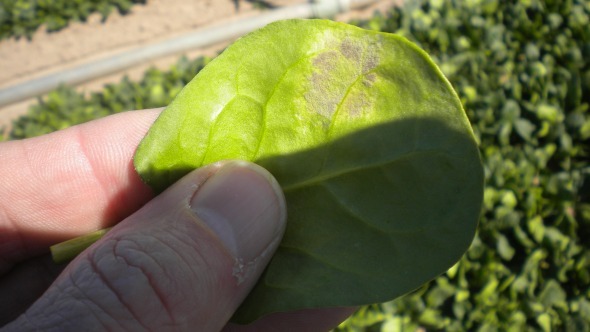 With new races of downy mildew popping up in spinach over the last several years, growers have had to use many tools to stay a step ahead of the devastating disease. According to Jim Correll, researcher and professor of plant sciences at the University of Arkansas, downy mil-dew is the number-one disease in spinach production almost anywhere spinach is grown. “The last two years have been the most severe I’ve seen over the last 25 years,” Correll says. Because of the increased density at which spinach is being planted, new strains have multiplied rapidly, with 10 of the 15 known races developing in the last 10 to 15 years, according to Correll. Acreage in organic spinach is increasing, Correll says, and many organic growers are struggling to find control options to deal with downy mildew. “With organic production, the only management tools you have are resistant [varieties]. Once you get mildew in a field, there’s very little you can do,” he says. Downy mildew spreads rapidly, so it’s important to recognize symptoms before it’s too late, Correll says. The spores are airborne, and when they land on the leaf tissue, if there’s any free moisture they will germinate and infect the tissue. This leads to chlorotic spots that can turn brown and become necrotic as the lesion progresses. “Under favorable weather conditions, which are typically cool and wet, you can have the organism go from a spore to an infection, to new spores and new infection in as little as six to seven days. You can go from one lesion to literally thousands of lesions in as little as a week,” Correll explains. Once the infection occurs, you will see discoloration on the leaves in as little as four to five days. In November 2012, a new race of downy mildew was identified in Imperial Valley, CA. The strain, named Race 15, is prevalent in both California and Arizona, and has overcome the resistance of race 1-14 resistant varieties. “Numerous other races are occurring simultaneously with race 15, and they’re races that we’ve identified in previous years,” Correll adds. One technique organic growers use to manage the growing number of resistant races is to use a combination of varieties with varying levels of resistance. Correll does mention, however, that in the near future several varieties will be released featuring resistance to races 1-15. Much of Correll’s research is supported by the California Leafy Greens Research Board Program in conjunction with American Vegetable Grower® magazine columnist Steve Koike of the University of California (UC)-Davis. “We typically monitor what races are prevalent in different areas by getting samples from growers and various Extension personnel, and conducting surveys. From that information we can make an educated guess on what varieties with certain resistances would perform well in certain locations,” he says. There are a number of commercial fungicides both at the seed treatment level and the foliar application level that are effective in managing downy mildew in conventional fields, Correll says. Correll also highlights the need for preventive spraying in order to stay one step ahead of the disease. “Because the crop is harvested in such a short period of time — as little as 21 days, or up to 35 days — many growers are actually putting on preventive sprays before they see symptoms. Often times, by the time you see symptoms, it’s too late to start a control treatment,” he says. Correll says reducing leaf wetness can be a key preventive approach because the pathogen thrives in wet conditions. There is also what Correll refers to as the “green bridge” effect. Because the downy mildew pathogen requires living plant tissue to complete its life cycle, if there’s no plant, the organism cannot be active. The “green bridge” refers to the green tissue that’s available for the organism to perpetuate itself. To address the downy mildew crisis, Correll says that there have been several urgent meetings called the past three years to brainstorm management tactics. Furthermore, Correll also helped organize the University of Arkansas’ International Spinach Conference in Yuma, AZ, in February 2015. The conference featured 250 growers and speakers who addressed global spinach production, spinach breeding, and downy mildew management. To help further research, Correll and Koike together received $1 million in USDA specialty crop grants to evaluate how downy mildew races are evolving to overcome resistance. 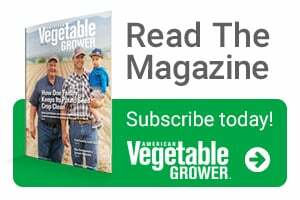 Alexander is a former associate editor with American Vegetable Grower® and currently a contributing writer in Denver, CO. See all author stories here.